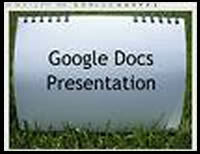 Google Presentation is a versatile tool. Since a presentation can be published online and linked to a blog or website, perhaps a good use of this tool is for guided student learning. After all, this Cool Tool is really only a blank page. I’d like to share an example of a Google Presentation that integrates many of the Cool Tools discussed on this blog. This is a series of guided learning opportunities for students that focuses on Internet safety and introduces students to some of the Web 2.0 tools they might be using to create and share their learning. Please take a moment to view Design Your Digital Self, by Veena Rajashekar, Beye School. Prezi is an online presentation tool that’s quite exciting, and certainly a welcome change of pace to the traditional slideshow. Prezi abandons the concept of using slide after slide to display bulleted text, and instead uses one giant canvas to hold all of the content. Viewers follow a path set by the author to explore chunks of information, and zoom in to take a closer look. You can embed videos and images, create links, and have a lot of fun creating and viewing Prezi presentations. This nontraditional presentation is a Cool Tool for changing the way students and teachers disseminate information and ideas. Perhaps Prezi could be used to help students do something with all that information that’s out there, and it could be used to encourage them to remix and create rather than regurgitate. Prezi seems very well-suited for the 21st Century Classroom. If you want to try Prezi yourself, it’s fairly easy to use, especially if you take the time to view the tutorial before getting started. You can sign up for a free account to get your feet wet and decide for yourself whether or not Prezi is for you. Compatibility with PowerPoint combined with the ability to easily publish slideshows online makes Google Presentation a Cool Tool for creating and maintaining student portfolios. I know of two innovative teachers in D97 who are building these portfolios, and they are definitely worth taking a look at. What a great way to celebrate the learning, progress and talents of your students, and what a fabulous way to share with relatives and friends across the world! I’ll bet these students love having their work published and it certainly does encourage people to check your blog. Please comment to share your thoughts about these kindergarten portfolios of student work. Just click the link below and type a message into the box.